Paramount is going through an awkward moment. Looking back, the studio’s CinemaCon presentation could only highlight 18 Oscar nominations; looking forward, the release slate is skimpy and Nickelodeon division’s is woeful, anchored by “SpongeBob SquarePants” and designed to make the studio look like they have exploitable IP. That said, change is coming: Genial ex-Fox chairman Jim Gianopulos replaces outgoing 12-year veteran Brad Grey. (Said worldwide marketing president Megan Colligan, “We are thrilled to have him leading the ship and taking us into our future.”) Gianopulos has full greenlight authority over what remains of the studio’s skeleton crew, but he needs top-level (and top-quality) help. One production candidate, Scott Stuber, skipped to Netflix, while Oscar producer Michael DeLuca kept his lucrative deal at Universal. The studio does have two franchises it can still exploit. “MI 6: Mission Impossible” starts shooting April 8 in London, India, Paris, and New Zealand, for the first time in IMAX 3D. 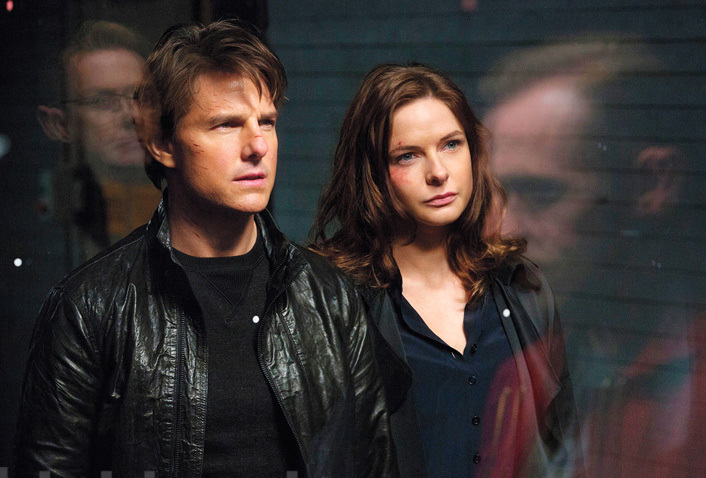 Tom Cruise rejoins his team, Rebecca Ferguson, Ving Rhames, and Simon Pegg, with newbies Alec Baldwin, Sean Harris, Vanessa Kirby, Sian Brooke, and Henry Cavill; it’s slotted for release July 27, 2018. Bay liked the resulting script so much that he came back to direct a movie that merges a King Arthur Merlin legend with a continuing dystopian saga led by returning star Mark Wahlberg, with help from Anthony Hopkins and a youthful ensemble including pouty British babe Laura Haddock. Bay insisted on shooting much of the movie in IMAX 3D — the only summer 2017 movie to do so — melding two giant cameras for maximum clarity. “This is my last one, ” he said, “so I’m going out with a bang on a big-scale movie.” Whatever you may think about Bay, he knows how to shoot 3D better than anyone shy of James Cameron. Even in 2D, the Camelot battle scenes are stunning, as King Arthur’s knights in armor on pawing horses duck flying balls of fire. Bay intercuts with a post-Optimus Prime future where chaos reigns amid battle-scarred rubble monitored by robot police. Bumblebee is one surviving Transformer. “You want to know, don’t you, dude, why they keep coming here to earth?” Hopkins asks Wahlberg. A couple played by Matt Damon and Kristen Wiig decide to take the shrinkage, consume less, and enjoy more in their new miniature Leisureland mansion. Payne’s arresting footage shows the hospital shrinking procedure, as big people are shaved and zapped into tiny versions of themselves, scooped up with spatulas like baby wieners into mini bassinets. In another provocative first look, Alex Garland’s stylish follow-up to “Ex Machina,” “Annihilation,” explores the unexpected reappearance of the missing husband (Oscar Isaac) of a grieving woman (Natalie Portman). Where has he been for 12 months? On some covert mission? Why doesn’t he remember anything? When he starts coughing up blood, operative Jennifer Jason Leigh turns up to try and solve the mystery. In George Clooney’s “Suburbicon” (November 3), Damon and Julianne Moore costar as a hapless husband and wife who are suspected of having offed her sister for the insurance money. They are being harassed by a suspicious insurance agent (Oscar Isaac) in the ’50s black comedy, written by Clooney, the Coen Bros., and Grant Heslov. Described by Dwayne Johnson as “the craziest, the sexiest, the funniest R-rated comedy of the summer,” TV remake “Baywatch” (May 26) does look pretty funny, especially the byplay between Dwayne Johnson’s chief lifeguard and neophyte Olympian recruit Zac Efron. (One hilarious scene in a morgue begs description.) Needless to say, Paramount did not miss the chance to eye-candy the Colosseum stage with muscular guys and girls in red bathing suits. 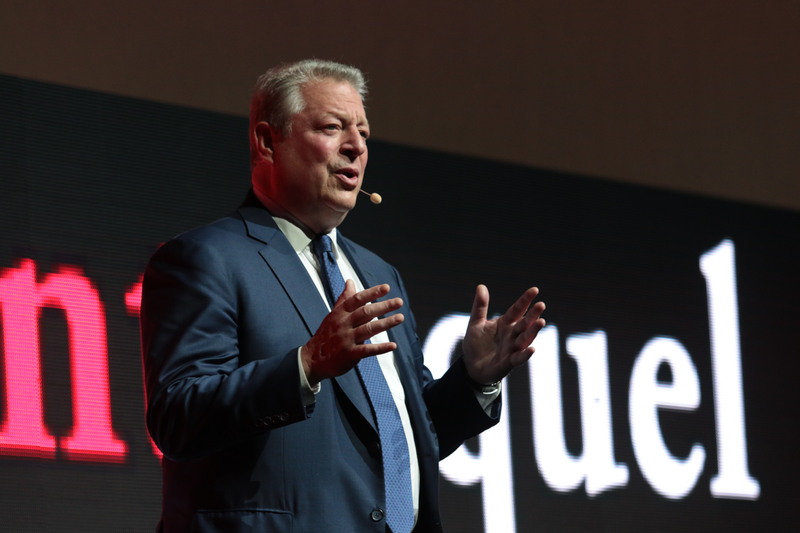 Al Gore at CinemaCon 2017. In the Paramount pipeline are two thrillers for October: Darren Aronofsky’s “Mother” stars Jennifer Lawrence and Javier Bardem (October 13) and J.J. Abrams is cooking up another low-budget “Cloverfield” sequel (October 27). A sequel to “Daddy’s Home” ($240 million worldwide) reunites Mark Wahlberg and Will Ferrell (November 20) and adds scary granddads John Lithgow and Mel Gibson. Bringing up the rear, Johnny Knoxville returns in another stunt-filled comedy, “Action Point” (March 23, 2018). While many of these movies may not be big grossers, Gianopulos has inherited an eclectic slate.